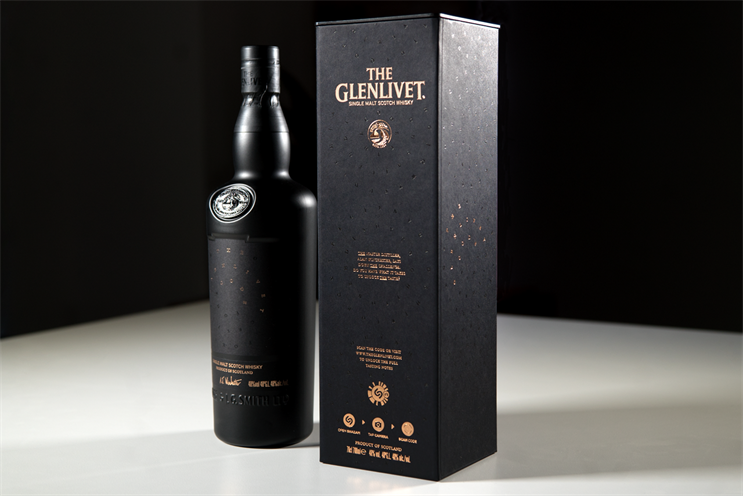 Shazam and Glenlivet have launched The Glenlivet Code, a limited-edition single malt whisky and the latest in its annual release of "mysterious" bottles. Inspired by British Code-breakers, the previous bottles were released under the names Alpha and Cipher. Each year, the bottle is released without cask information or tasting notes to get whisky connoisseurs to put their Single Malt knowledge to the test. The release of this year's $120 (£85.33) bottle is supported by an interactive digital experience. Each bottle comes with a Shazam code that, when scanned, unlocks an AR experience that invites the user into a virtual underground room. Here, they are greeted by a hologram of The Glenlivet’s master distiller, Alan Winchester, who will challenge them to decode the taste of the liquid by selecting four aromas for the nose and four flavours for the palate from thousands of possible combinations. After decoding the flavours of the new whisky, participants will be given a score which they can post on social media to see how they rank against their peers. The official tasting notes won’t be revealed until the end of the year to give Single Malt enthusiasts the time to discover and enjoy the liquid themselves. Winchester said: "With The Glenlivet Code, we had a unique opportunity to create a whisky that has never been crafted before, using new casks and techniques to push the boundaries of what people expect from The Glenlivet. "This year’s limited edition is a labyrinth of flavours that will test the senses of even the most discerning whisky drinker and we’re excited to invite consumers worldwide to take on the ultimate challenge by unlocking its mystery taste." The experience is educational for whisky enthusiasts and will help them develop a deeper understanding of the brand, he added.